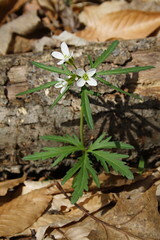 Many Cardamine species were used to spice up food. The peppery roots were grated and used like horseradish (hence pepperroot). 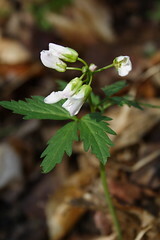 The commonest name, toothwort, comes from the plants’ use as a popular but ineffective salve for toothaches and also alludes to the rootstock’s crinkled shape, which resembles teeth (this gave rise to still another common name, crinkleroot). I’m afraid the more I read about Toothwort, the more confused I become. For one thing, it has been reclassified since my field guides were written. 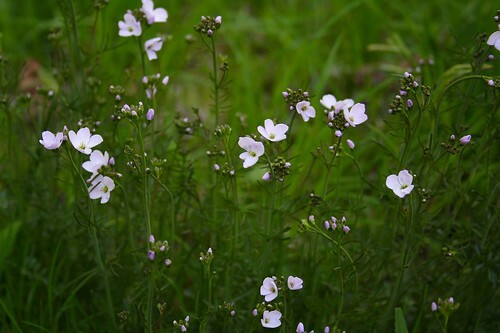 Formerly called Dentaria, they are now called Cardamine. And, depending which field guide or Internet source you use, the common names appear interchangable between the species with a few exceptions. 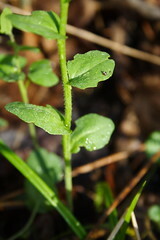 I’ve run across a couple of other plants that also have clusters of 4 petals… They aren’t toothworts. But they are Cardamines! 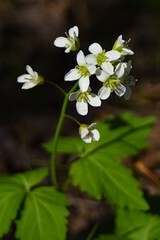 Using Newcomb’s Wildfower Guide, I came up with Mountain Watercress (Cardamine rotundifolia) for this plant. After poking around in the USDA database and other places on the Internet, I’m no longer 100% sure. (According to the range map, it’s not supposed to be in Chautauqua County, though it is in neighboring Cattaraugus County.) These Cardamines are difficult. 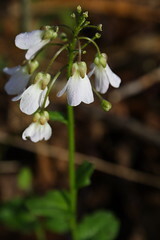 I love the Cuckoo flowers. They grow almost anywhere and are very aesthetic. Gotta love those mustards! We only have two Cardamine here, C. oligosperma, which I haven’t seen, and, C. californica, commonly known as Milkmaids or, you guessed it, Toothwort! My exhaustive (and exhausting) guide to SF-area flowers lists 4 sub-species of C. californica, but I’ll be damned if I’m going to spend time trying to ID wildflowers down to the subspecies – they’re plenty difficult enough to get to a species! I’ve realized that common names are almost totally useless when discussing wildflowers, since one name can refer to so very many different species. You always challenge me to look for something new. Our Jack in the Pulpits are just coming up now. Have you heard of James Rockets? They are four petalled in white and purple and quite tall. I thought they were a type of Phlox but someone told me no. I’ve looked in 3 flower books. It’s got to be a perennial. Maybe it’s a wildflower because they have been seen along the roadside and parks. I’m looking for some information on them, and of course a picture to help verify.